Minneapolis, MN : Bethany House Publishers, 1996. 272 p. : 22 cm. Compact guide to world religions : understanding and reaching followers of Islam, Hinduism, Taoism, Judaism, Secularism, the New Age, and other world faiths. 100 ME:PersonalName 1_ $a Personal name Halverson, Dean C., editor. 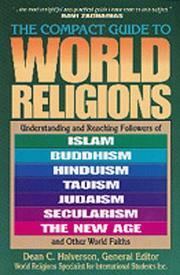 245 Title 10 $a Title Compact guide to world religions : understanding and reaching followers of Islam, Hinduism, Taoism, Judaism, Secularism, the New Age, and other world faiths. 300 Physical Desc __ $a Extent 272 p. : 22 cm. 500 General Note __ $a General note Includes bibliographical references and index. 541 Acq Source Note __ $d Date of acquisition 2006/04/26. 650 Subj:Topic __ $a Topical term Christianity and other religions.